Daimler was one of England’s earliest builders of automobiles, having bought the British rights to the respected Daimler name from German pioneer Gottlieb Daimler. Pronounced (in the UK) DAME-ler instead of the German DIME-ler, they really aren’t well known in the US. One brave effort to crack the American market was the SP250 sports car introduced in 1959. 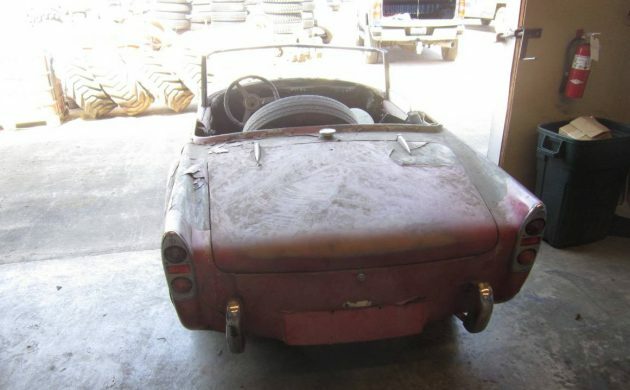 Another brave effort is this three car Daimler SP250 package for $14,000 on Craigslist in Chehalis, Washington. 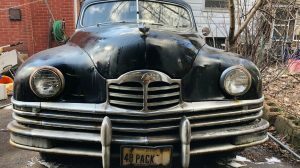 The management of Daimler saw the success that Jaguar was having selling sporting cars in America and their new 2.5 liter, hemi V8 seemed like a natural power plant for a competitive sports car. Daimler’s stylists created a car they thought we Yanks would love, with finned rear fenders and a gaping chrome grille. The problem was that America was almost over the whole fin thing. Another problem was the original model name. Daimler chose “Dart” and introduced the car at the 1959 New York Auto Show. It was hastily renamed SP250 when Chrysler mentioned their ownership of the Dart trademark. 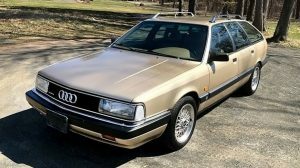 SP250s are an acquired taste, but their relative rarity is driving their values up, looks notwithstanding. The front end has a distinctive catfish look about it while the rear end is slightly easier on the eye. Various bulges and creases work to break up any smooth lines in the all fiberglass body work. A close look at the upper edge of the grille shows the distinctive fluted edge that dates back to Daimler’s earliest days, and later used on some high-end Jaguar models. 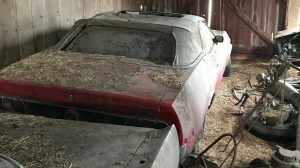 For $14,000 the buyer gets one complete barn find car with some known history, one slightly less complete car and one body only. There is a package of additional parts that includes an engine, suspension parts wheels and other miscellaneous items. It may be possible to build two complete cars from the bits included in the sale. 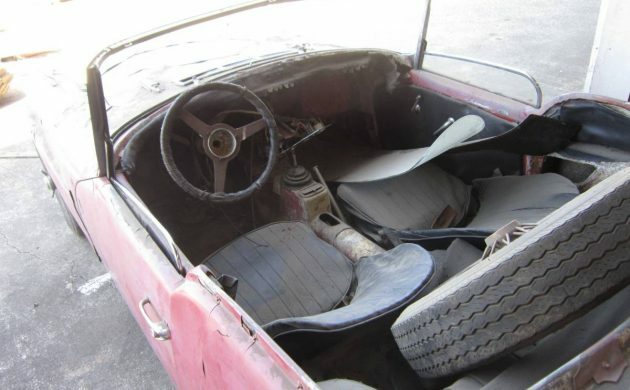 What parts are missing might be found in the US, but membership in the UK Daimler SP250 Owners Club would help put the new owner in touch with sellers of used parts. 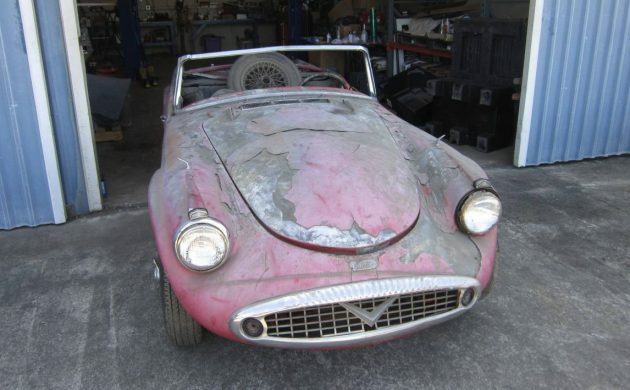 Daimler SP250s aren’t for everyone. The all-British shows I attend usually bring out a couple of them and the uninitiated tend to point and giggle. That’s too bad, because these cars are appreciating and the supply is limited. The little V8 engine is a gem and has a lovely exhaust note. Maybe a Daimler SP250 is what you need to stand out in a crowd. Carp are more streamlined, eh? “Daimlers In Distress”: I see what you did there, Rodney! In February he had five cars for sale on craigslist asking $65K, I guess he sold off the two nicer ones, and these three are still available. I always thought: Nice engine, shame about the body styling and chassis. I’ve mentioned previously that the li’l 2.5 litre hemi V8 is quite a magical mill. In the Daimler-trimmed MkII Jag body, they were quite lovely to drive, although no match for a 3.8 XK six. As Beatnick said, the 2.5 liter V8 is special…one of the smallest road going V8s made. Police in some jurisdictions in the UK got SP250s to use as chase cars on the motorways, and they did very well in that role. The engines had pushrods, not overhead cams, so altho the SP 250 wasn’t cheap to make and buy, it wasn’t as expensive as the exotic Italians of the day. Put a hook in the grille. I thought they were unconscionably ugly back in the day and time has done nothing to change that. On the other hand the motor would be nice stuffed into a Spridget or MGB. I like this quirky, instantly obsolete design, but I’d have to dress like the late Noel Harrison (deerstalker hat, country tweeds, etc) to look credible in it. 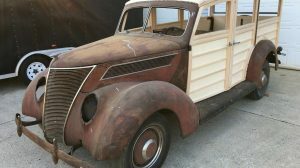 I always try to see the beauty in all cars but these look like they were the styling inspiration for the Packardbaker! It would have to be an aquired taste. Yeah, I just don’t get the fish mouth styling( like the Sabra too) Fish are gross. We think of a hemi as these fire breathing monsters, but this really is no big deal. It did deliver “spirited” performance, M/T claimed with 0-60 in 9 seconds and a 16.9@83 mph in the 1/4, about the same as a Sunbeam Tiger, believe it or not. They certainly had a distinct exhaust note, not found on most British roadsters. These were, like the Tiger, front heavy and iffy handling. If you could get past the styling, it’s a heck of a car. Would be advisable to check model year as the early ones had a very flexible chassis, rectified on later versions. Early models would have doors flying open due to flex especially when cornering. The hemi engine was the reason Jaguar bought Daimler out! A guy here used to have a Beechcraft Bonanaza with one under each wing in a hangar. Look up Russ Carpenter he was getting 1000hp out of these engines back in the 70’s ! Not so clever with the comments girls . One of the 3 needs to be brought back to original! Such history deserve it! Jaguar bought Daimler because they needed the production facilities and later axed the SP250 because of the competition it gave to the XKE. The engine looks real heavy because of the width. 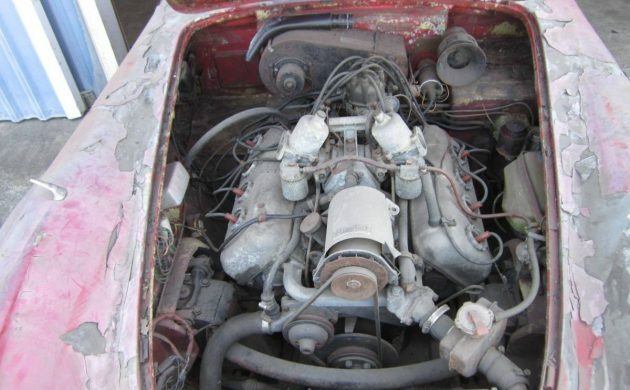 ( in my opinion too wide for an MGB chassis and also too tall because of the carburetor set up. I don’t believe that the engine is not any heavier than a small block Ford. As I have been playing with one (Daimler 2.5 V8) on an engine stand lately performing a rebuild.Also. The engine is set back farther in the chassis than the Tiger along with a longer wheelbase. I would have to give a decided edge to the SP250 Dart. I spent a week with one of these back in the late 60s (I was helping a friend by taking care of his car while he moved). It was an absolute blast to drive and the little V8 was great (it looked and ran – and leaked – like a shrunken Chrysler Hemi). But I could never get past the car’s looks. No matter how it drove, it was always a car that you parked and walked away from without looking back. With a body transplant, this could have been a classic. Its looks have not grown on me. Its still ugly.. I had custody of one in Anchorage, January-May 1965. The engine was easily the best part – it would start so easily at subzero temperatures that I’d been cautioned to keep the choke in for the first few turns just to make sure everything was free. Choke out, instant start … decent handling and phenomenal braking (4-wheel disks, no servo!) on icy/snowy roads; very good handling on sand or gravel. Get enough traction, though, and the massive unsprung weight and floppy frame made things just too interesting. Flexy frame cost me the very expensive hardtop, though, when I ran over some rippled road at 70+ and the curved glass back window popped out and turned into billions of bits. As a fast cruiser it was sublime. At around 75 in fourth you can ease back on the throttle and just surf along on the torque curve, with the engine burbling gently like a big old Chris-Craft. More than made up for the shortcomings. Neat-o….one was on my list but I’ve got to shorten it at my age…..
No doubt, these young people just don’t seem to know a valuable classic car if it jumped up and bit them in the????? In “The Unfair Advantage,” Mark Donohue tells of once racing a Daimler. He used to go through the center bearings a lot. The bearings in the centre ! I think they secure the master bolt. 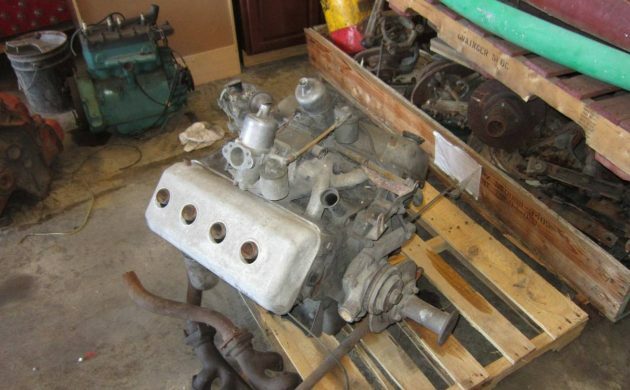 The problem would seem to be stability of the block itself, since the 2.5 liter Repco V8 (I’m mostly remembering here) used in the Tasman Challenge cars was an Olds aluminum engine with a Daimler crankshaft. The Daimler 2.5 and 4.5 V8s were Edward Turner’s first water-cooled engines – he was best-known for his Triumph and BSA twins – and any weakness in the center bearing suggests to me that the block was insufficiently rigid. I must also admit that I am not an engineer, merely an interested hobbyist.